Seriously, can you pack anymore awesome into a single headline? A brand new sequel to the 1984 classic The Karate Kid is on the way and this one, like the first three films, stars Daniel LaRusso himself, Ralph Macchio. It’s a streaming show called Cobra Kai and will also star William Zabka, best known as playing the evil Johnny Lawrence in the original film. He’s the star of the show, which takes place in modern times, 30+ years after the original film. The Hollywood Reporter says the show “revolves around a down and out Johnny who, seeking redemption, reopens the infamous Cobra Kai dojo. 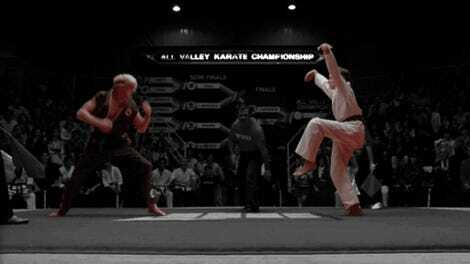 It reignites his rivalry with a now-successful Daniel, who has been struggling to maintain balance in his life without the guidance of his mentor, Mr. Miyagi.” And each handles their issues through karate. All of which, from a pure nostalgic point of view, sounds incredible. But here’s where it gets a little weird. First, Cobra Kai is described as a “10-episode half hour comedy.” Second, the show will be exclusive to YouTube Red, YouTube’s premium subscription service. The YouTube Red thing we can get around. Big name, marquee shows have been a good way for services like this to get new subscribers and, as a Karate Kid fan, I will pay almost anything to see the further adventures of Daniel and Johnny. The comedy thing, though? That worries me. Is this a sitcom? Single camera? The Karate Kid movies had humor in them but they were never comedies. They weren’t dramas either. They were just kind of family films, a mix of everything. Hopefully “comedy” is in more of the Golden Globe, catch-all definition of the word. Because if the show is 50-year-old men trying to fight with a laugh track and a studio audience, my heart is going to break. Josh Heald, who wrote the Hot Tub Time Machine movies, will co-write with Jon Hurwitz and Hayden Schlossberg, who did the Harold and Kumar movies. Hurwitz and Schlossberg will direct most of the episodes too. The question with that creative team is whether they’re going to stay true to the nostalgia of their childhood and keep The Karate Kid fun and inspirational, or will they embrace their more recent work, which is much more comedy focused. We’ll find out in 2018, as that’s when Cobra Kai will be released. 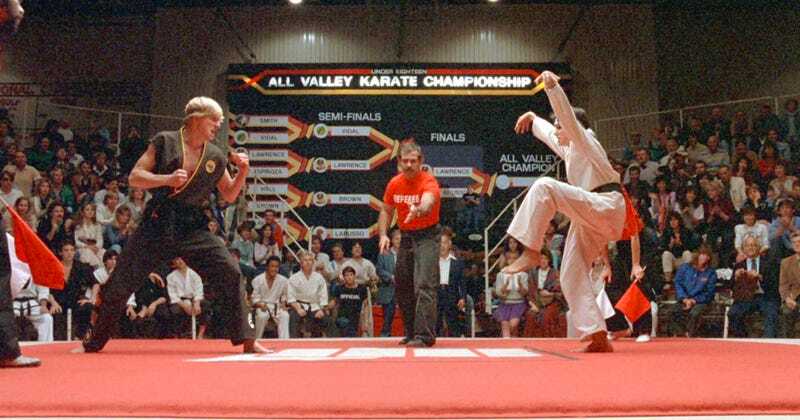 Why Is There A Nationals Cap In The Original Karate Kid?